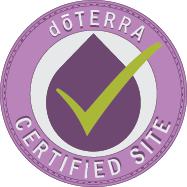 What does the dōTERRA certified site seal mean? Having the dōTERRA certified site seal on your website is a BIG deal! This means your site has been approved by corporate and every single thing on your site is 100% compliant in regard to dōTERRA. This also means you have been granted special permission and are allowed to talk about dōTERRA essential oils, dōTERRA products and the company on your website! Not everyone can do this, so for the people who have been allowed, please stay compliant in order to ensure that the information we as Wellness Advocates are putting out there is accurate. How can I get the dōTERRA certified site seal on my own website? You will need to visit the official dōTERRA certified site registration page found here. Once your site is approved, this means your website is ready to have the dōTERRA Certified Site Seal put in place. You will receive a link to a page where you can generate the code for the seal and the code will appear for you to copy and add to your site. Each day this seal is in place on your site, a special system will check to make sure your site is still compliant. Per corporate, the seal and rights to use dōTERRA trademarks may be removed at any time. Once you complete the process and have been approved to use the dōTERRA certified seal on your webpage, you are then allowed to use dōTERRA trademarks - as long as you also make sure all claims made about essential oils and dōTERRA products are from the Approved Claims List that the company provides. You MUST use approved wellness language when discussing dōTERRA products. You will receive an email from corporate with detailed information on how to properly display and utilize the seal, as well as talk about the company and products. If you have any questions, please contact the dōTERRA Claims Education Team and they will help you get started.